I arrived in Sydney jet-lagged, in need of a good shower but totally ready to hit it. After that welcomed shower at a friend’s pad I headed straight into the city centre or the CBD as they call it here. I wandered the main streets, grabbed a smoothie and took in the atmosphere. There were street entertainers just feet away from each other, and so much to look at I knew I was going to be in for a good few months here. Sydney is a truly breath-taking city, a wide mixture of landscapes; beautiful sunny skies and so much going on you don’t know where to look! The thing that struck me about the city is that one minute you will be walking amongst skyscrapers and then will hit the harbour with the skyscrapers behind you and the Botanical Gardens to the side of you. The overpowering scene of the Harbour Bridge and the Opera House is something you will never forget after seeing it for the first time. We see this scene in books or on the television and it looks spectacular, and I have to say, in real life, it is even better. Just from wandering around I can see that you can never be bored in this city, an array of bars, coffee shops, museums and all the shopping you can do awaits you. Or if you are more of the outdoors type, just taking a stroll through Centennial Park, Hyde Park or the Botanical Gardens will keep you busy for many hours! Away from the city I am staying in hostell in Bondi while on my 2 week Sydney experience with Oyster. I also have a flat with some friends in Bondi that we sorted out before we arrived that I will be staying in for at least 3 months while I work. Bondi: the famous Beach that everyone who visits Sydney has to experience. Surfers walk barefoot down the street with nothing but their boardies on and their surfboard under their arm, bronzed guys and gals enjoy the beach and the surrounding bars, restaurants, coffee shops, smoothie bars around them. Although rather touristy and commercial Bondi is something special, the area has a certain atmosphere about it that you can’t but help fall in love with. So far I have had an orientation around the city, sorted out all the admin that we need to have, had a surf lesson on Bondi, an attempted BBQ (there happened to be gale force winds on Bondi that day so wasn’t overly successful! ), completed my Responsible Service of Alcohol Course, had some crazy nights in some of the local bars, some very good dinners, started looking for jobs both in Bondi and the central city area. ..and I am only a week in! 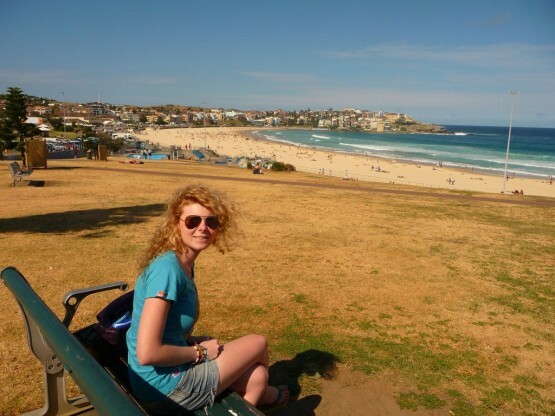 We have also enjoyed a lot of free time to go on job hunts and to just chill out and take in all Bondi has to offer. There is a lot more on the agenda for the coming week. I am looking forward to canoeing to Shark Island with awesome views of the harbour, a trip to the Blue Mountains and a possible trip to the Zoo. My names Matt, and I am currently deciding between going straight into work from college, or taking a “gap year” in Australia. I’m seriously considering applying for a (work placement) gap year with Oyster in Sydney, it sounds amazing to live out there and to experience life in another country.. without the parents! I just want to know how you went about planning for such a trip, and how easy, or hard it is to settle down and find a job? Thank you for your comment on Jenny’s blog! I have emailed her today just to let her know of your questions- I am not sure how often she has access to the internet but I hope that you will hear from her soon. Great to hear that you are thinking about taking a Gap Year in Australia. I would not hesitate…DO IT! There is something about Australia that is just so fascinating that i really do think everyone should experience it. After my first Gap Year in Canada with Oyster…i wanted more. The place i really knew i would end up in on my second Gap Year after Uni was Australia…i just felt a magnetnic attraction to it. And i worked for it. The way i planned it…i finished Uni in June and immediately started work to earn the money. I worked solidly for 7 months (not so neccessary…you can save money in less time…it is just the way it worked out for me!) and during that time i choose a goal, a date that i would stick to and that would be my departure so i started researching flights and booked. The next step was my Visa which is very easy to do online, then Insurance. Once all of those things are done you are good to go…just the packing and the goodbyes. It all sounds easy, and it is beacause you get help all the way with Oyster. That is the best thing about taking an organised Gap Year, you are not alone, you get tons of help and reassurance. Settling in here is very easy…you feel like you are home in a couple of days. Plus you meet the people you are spending the first two weeks and possibly longer with on your very first day, so again, you are not alone. Oyster put on great activities in the first two weeks as well as getting help with all admin and job searching! You have to be proactive on the job search yourself though, you have to do lots of CV dropping face to face with employers and applying online with the recruitment agency that Oyster set you up with. If you want a job and you are active and enthusiastic, you will get one. Hope this helps your decision! GO FOR IT! I’m thinking about having a gap year from my University course starting next summer and really want to come to Australia! But i’m a bit worried i won’t make enough money to live over there? I’m obviously going to save up plently of money before i come to Australia, but how often do you work at the minute to cover your living costs? My advice…do not hesitate…if you want to come to Australia…come to Australia! You sound like you have plenty of time to save up, and i definately advise that you save up as much as you can, you will be more relexed when you get here and not having to worry about getting a job straight away. Jobs are here if you want them, but you do have to look. The job finding service is great with the Sydney programme and will point you in the right direction but you do have to put yourself out there as well. The great thing about the job finding service is that you will be signed up for a year and you can find jobs all over Australia, so you don’t have to stay in Sydney! You could find a job somewhere completely different and just use those two weeks on the programme to enjoy Sydney. It really is up to you. I work between 40-50 hours a week in hospitality in the Central Business District on a lower wage than most…i get $13.50 an hour after tax. This is a lower wage for hospitality, you can potentially earn $15-20 p/h. However this is enough to live on. This allows me to pay my rent which is $180 a week. This rent is fairly pricey, but that is because i live in Bondi Beach, you can find cheaper accomodation around. After my rent i i leave a little aside for weekly expenses; travel to and from the city, food and days off where i try and do something different every day off i get to make the most of being here. The rest i leave in the bank for savings, i am managing to save between $200-400 a week depending on hours, which is really good. I am saving to travel up the east coast, i have booked a camper van with 2 friends and we are driving from Sydney to Cairns where i will be doing Byron Bay, Surfers Paradise, Brisbane, Australia Zoo Surfing in 1770, Fraser Island Tour, Sailing the Whitsunday Islands and ending in Cairns with a Barrier Reef Tour and Cape Tribulation for a couple of days. I have managed to save up for all of this after working for 8 weeks and i still have 6 weeks to go….and enjoying all Sydney has to offer along the way too! I hope this has inspired you…don’t panic about money…there are options and it is good to be flexible. You don’t have to stay in Sydney…after the two weeks and you haven’t had much luck on the job front (which is unlikely) you could head somewhere else, do farm work like the others in my group did. Aslong as you are flexible and open minded Australia is yours for the taking! Sorry this is quite a bit later than all the other posts but firstly thank you for posting about your experiences in Sydney, sounds amazing! I have applied to university starting next autumn, but am considering taking a gap year before that and would love to go Australia! I like the sound of the Oyster Sydney programme, it sounds exactly what I’m looking for but I’m wondering how important it is to go with friends or have people out there you already know? I know nobody in Australia and none of my friends are planning on taking gap years, is it fairly easy to meet new people and travel with new friends? I’m not sure how much I like the sound of doing it all on my own. Also, do you think it is better to take a gap year like this one before or after university? First of all, in answer to your last question about whether it is best to do a Gap Year before or after University…I did both and I have to say…if I hadn’t have done my first Gap Year, I don’t think I would have had the confidence to firstly go to Uni or do the second Gap Year! So I truly recommend doing one before University. I went to Canada with Oyster on my first Gap Year, I did not know anybody, I met the fellow Oyster group properly at the pre departure course and then again at the Airport…within a few days…we were the best of friends…and still are. Going on Gap Year gave me the confidence to make friends and live life on my own away from my family and friends and become far more independent than I was. My Gap Year allowed me to go to University full of confidence and excitement, before my Gap Year I was not ready for Uni at all…but after Canada…I was ready for anything! My first Gap Year also gave me the travel bug, I found this want for seeing the world and experiencing all kinds of world cultures. I went to Thailand on a backpacking trip while on my summer break from Uni and started planning my trip to Australia for when Uni had finished. My trip to Australia was slightly different to Canada, I had managed to persuade 2 Uni friends to join me, they had never travelled before and were very anxious, but now, one is planning her next trip next year and the other is still out in Sydney after nearly a year after our arrival! They did not participate in the Oyster programme like me, but I felt that joining the programme gave me more stability and support with getting a job, and I also made friends with the other people in the group, so that was a bonus for me. I enjoyed having my friends there as support but if they weren’t there, having the support of the programme would’ve been more than enough! Once I started work I met even more people and made some great friends from all over the world, who I am still in touch with. Just as an example of how easy it is to meet people and travel with them, when I started my trip up the East Coast, myself and my two friends (one we had actually met in Oz and wanted to come with us) met a couple of people on a night out in Byron Bay…and they ended up being travel buddies, following us up the coast in convoy in our camper vans all the way to Cairns…it is so easy to meet people! The biggest adventure is travelling into the unknown, not knowing anybody but being given the chance to make new friends, not knowing the culture but being able to acclimatise yourself to it within days, not knowing where you might be staying tomorrow night…that is what travelling is all about!